Why have an open day? If we were a company, what would our product be, and how would we market it? An open day is an opportunity to show off what you have to offer and provide guests with something tangible to take away from it. There are around 2600 independent schools in the UK, so how can yours stand out? Open days are a chance to portray the school brand, after all. School open days create “a first impression that can last a lifetime”. It is important to make an open day a personalised experience. One way to achieve this is by creating an immersive open day experience - bearing in mind the different objectives you wish to reach. For instance, a prospective parent will be interested in the nitty-gritty questions whereas a prospective student will want an experience to be able to fall in love with the school and their #SchoolStories. Each of our #InspiringSchools has their own creative concept which should be promoted at open days. For instance, James Allen Girls’ School use portraits as their creative concept. At their open day, they used large photo frames at the entrances to encourage parents and prospective students to take photos and personalise the concept. 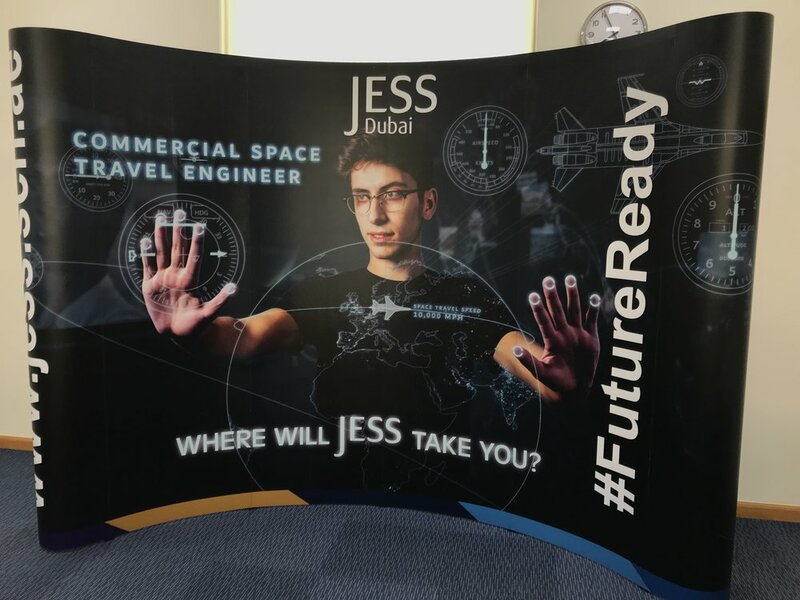 Here is a creative print that was used by JESS Dubai at their open day. Social media is a vital tool for open days, it’s an excellent way to spread the message and promote your branding. How about creating a customised Snapchat filter using your school branding? Why not try live streaming an open day? Prospective students and parents could be taken on a virtual tour of the school from the comfort of their own homes. Similarly, Google Maps is another great tool that can be used for open days. Just look at this virtual tour that we did with British School in the Netherlands. Open days are not just for parents; children should be involved and the tasks should be personalised. A treasure trail is not only an effective manner to get the prospective students to visit all of the important places following a treasure map, but it’s also fun! Furthermore, students will be provided with a tangible object to take away. This would be a great idea for an international school to show off the advantages of your school. It’s easy and engaging! Create a personalised passport and have visitors pass from room to room. Each time they enter a room they must get their passport stamped. It’s a great way to encourage them to enter rooms they might not usually visit on an open day. How about turning visitors into the next James Bond? You could have prospective students playing the role of a secret agent trying to discover clues to complete a task. This would be particularly suited to kinaesthetic learners as it’s a great tactile, hands-on approach to an open day. You could guarantee they’d be telling all of their friends about it. Use your open days to pique students’ interests in certain subjects. One way to achieve this would be by having fun facts scattered around the school for students to find (these facts could be subject-specific). After all, an open day is designed to get students and parents thinking about future possibilities. The ideas contained here are by no means an exhaustive list of possibilities. All of these open day ideas can be personalised for your school to show off all that your school has to offer. An open day should be an unforgettable experience with something tangible to take away. So next time you have an open day why not try something different? Has your school held a successful open day recently? What did you find worked well? What didn’t work so well? We'd love to hear all your thoughts on this topic. Please comment below.